Charming Villa beautifully distributed on one level with guest house, south-west facing with panoramic views situated in the urbanization La Sierrezuela. Entrance hall with guest toilet, large living room with fireplace and 2 accesses to the porch with several seating areas and open views. Large independent and fully equipped kitchen with nice breakfast table plus pantry. The 4 bedrooms are double with wardrobes of which the master bedroom has direct access to the porch, en suite bathroom with shower and tub, and also dressing room. The second bedroom also has access to the outside and bathroom en suite. Bedrooms 3 and 4 share a bathroom with shower which is also accessed from the pool area. The property is in very good condition with marble floors, pre-installation of air conditioning, awnings and alarm system. The guest house has own access and consists of a living room with fireplace, equipped kitchen and open to the living room, a double bedroom with fitted wardrobes and a bathroom with shower. Outside: Elegant access for vehicles with automatic gate and capacity for several vehicles plus a closed garage for a car and storage. Heated pool with 100% privacy surrounded by terraces with sun all day and large patio with barbecue area. 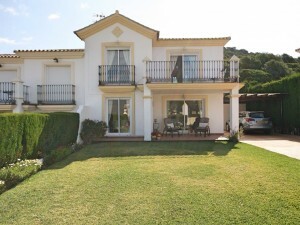 Easily maintained garden with automatic irrigation system, large storage room and pump room of the pool. There is also a large backyard ideal for children. 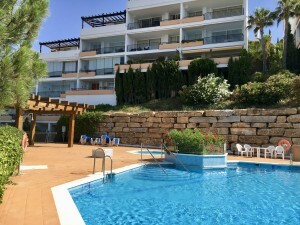 La Sierrizuela is a prestigious residential urbanization made up of independent Villas situated in a short distance from services and the beach of Fuengirola. 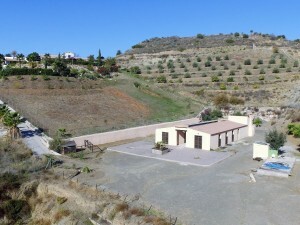 Plot 1.200m2. Total built size 231m2. Main house 177m2. Guest house 32m2. Garage 22m2. Swimming pool 50m2. IBI 1.095,20? per year. Rubbish 149,85? per year. Community 264? per semester (10% discount for early payment).